You won’t get more bang for your buck anywhere else! If you plan on running nitrous in your vehicle, be sure your engine and transmission can handle it. Also, make sure your timing is not over advanced and that you have sufficient fuel delivery. If your vehicle meets all of the required specifications, then you are sure to appreciate the increased power output. Here at New Level Motorsports, we have the nitrous oxide kits and nitrous oxide accessories to get you started. When you’re ready to give your engine an extra performance boost with NOS, be sure to check out our selection of nitrous oxide kits. If you’re going to do something, make sure you do it right. 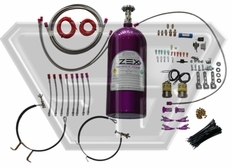 With a ZEX nitrous oxide kit from New Level Motorsports, you’re sure to get the most out of your vehicle.